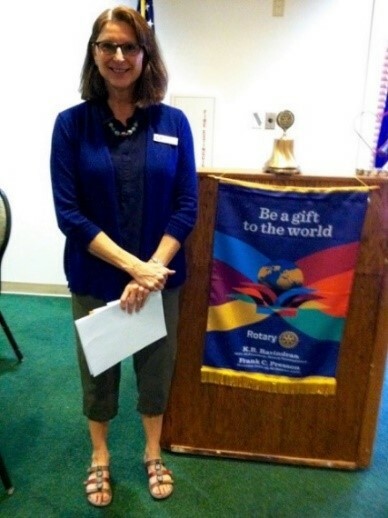 The Rotary Club of Sierra Vista recently met for their usual Monday lunch at the Hummingbird Grille at Pueblo Del Sol Country Club, with guest speaker Nancy Krieski, Sierra Vista Museum Curator, of the Henry F. Hauser Museum. She provided information about the unique and wonderful history of the city, and many interesting stories. One of the first stories, as Sierra Vista celebrates its 60th Anniversary, was on the person that named the City: Nola Walker. Nola arrived in Sierra Vista in 1939, and turned 94 years old this year. Ms. Walker’s story was in the Sierra Vista Herald a few weeks ago, describing her ‘vote collecting’ process and her announcement of the name of Sierra Vista as the ‘winner’ of the balloting for naming the city. Ms. Krieski shared many historical photos with the members of the club that included a picture of Daisey Maes, the oldest building in Sierra Vista, built in 1905. In addition, she provided a story about the original owners of the brothel and saloon, John and Ellen Riley, and why they moved from Bisbee to the location outside Fort Huachuca - to escape Bisbee taxes. She also discussed a hand written map the Museum has from Margaret Carmichael that literally lays out the early town, to include Fry Blvd, the current Elks Club, land donated for Saint Andrews Church, and other properties and sub divisions. But the Museum isn’t just photos. As, “the keepers of the evidence of the past”, there are many artifacts that have been collected. For example, a guest book from 1958 when the City Hall was built; an exchange of letters between a resident and the Mayor and Post Commander about bootlegging; Buena High School graduation book from 1953; and one item of special significance for the Rotary Club – a Rotary bell used by the Rotary Club of Sierra Vista, donated to the Museum in 2006. In addition, Ms. Krieski shared information about the historical plaque program, a project of the Sierra Vista Historical Society, which has over 20 historical plaques located around the City. Following the presentation, Mr. Brian Barkdull, President/CEO of the American Southwest Credit Union, provided three colorful graphics on the macroeconomics of why savers are receiving such a small return on their savings investments. This included a graphic on the Federal Reserve’s Assets from 2006 through 2015: treasuries, mortgage back securities, and other assets. Another graphic on the treasury rates and the federal funds targets, this from 1989 through 2016. The final graphic included a comparison between yield on loans, investments and COF, from 2003 to 2015.